Guidance is compiled and interpreted by professional pilots and physicians at FlightPhysical.com from the 2014 AME Guide pages 176-177, FAA and FDA web data (www.FAA.gov & www.FDA.gov), instructions specified in the Aeronautical Information Manual, Federal Air Surgeon Bulletins from 1999-2015, and 14 CFR Part 61 and Part 67 (the FARs). (d) Field of Vision: No acute or chronic pathological condition of either eye or adnexa that interferes with the proper function of an eye, that may reasonably be expected to progress to that degree, or that may reasonably be expected to be aggravated by flying. The applicant should be seated 40 inches from the target. An occluder should be placed over the applicant's right eye. The applicant should be instructed to keep the left eye focused on the fixation point. The white test object should be moved from the outside border of the wall target toward the point of fixation on each of the eight 4-degree radials. The result should be recorded on a worksheet as the number of inches from the fixation point at which the applicant first identifies the white target on each radial. The test should be repeated with the applicant's left eye occluded and the right eye focusing on the fixation point. A standard perimeter may be used in place of the above procedure. With this method, any significant deviation from normal field configuration will require evaluation by an eye specialist. Direct confrontation. This is the least acceptable alternative since this tests for peripheral vision and only grossly for field size and visual defects. The Examiner, standing in front of the applicant, has the applicant look at the Examiner's nose while advancing two moving fingers from slightly behind and to the side of the applicant in each of the four quadrants. Any significant deviation from normal requires ophthalmological evaluation. If an applicant fails to identify the target in any presentation at a distance of less than 23 inches from the fixation point, an eye specialist's evaluation must be requested. This is a requirement for all classes of certification. The Examiner should provide FAA Form 8500-14, Ophthalmological Evaluation for Glaucoma, for use by the ophthalmologist if glaucoma is suspected. The FAA may grant an Authorization under 14 CFR § 67.401 (the Special Issuance Section) on an individual basis. 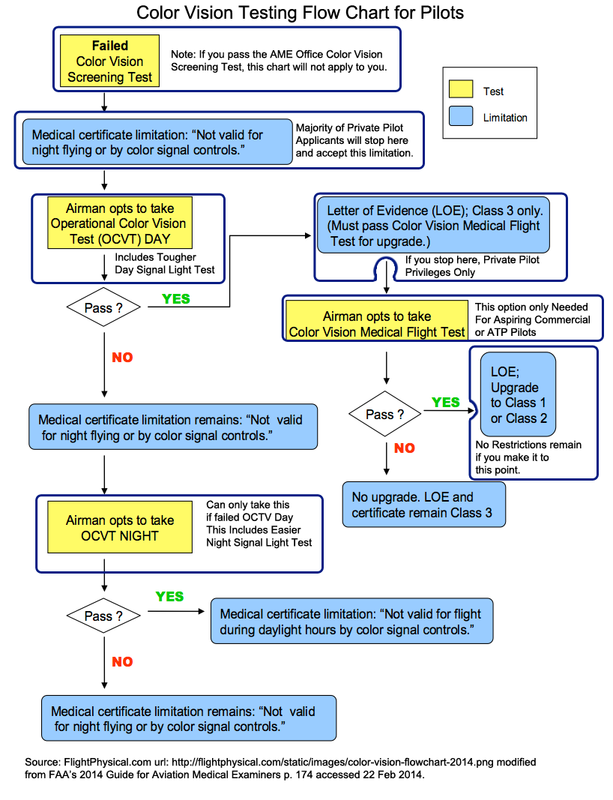 The Examiner can facilitate FAA review by obtaining a report of Ophthalmological Evaluation for Glaucoma (FAA Form 8500-14), from a treating or evaluating ophthalmologist. This page discussed the Field of Vision portion of the Eyes & Vision section of the Fight Physical Examination required of pilots.